This book examines a wide range of contemporary Russian writers whose work, after the demise of Communism, became more authoritative in debates on Russia's character, destiny, and place in the world. Unique in his in-depth analysis of both playful postmodernist authors and fanatical nationalist writers, Noordenbos pays attention to not only the acute social and political implications of contemporary Russian literature but also literary form by documenting the decline of postmodern styles, analyzing shifting metaphors for a "Russian identity crisis," and tracing the emergence of new forms of authorial ethos. 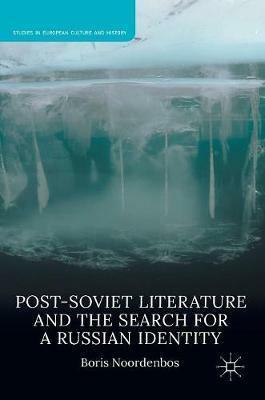 To achieve this end, the book builds on theories of postcoloniality, trauma, and conspiracy thinking, and makes these research fields productively available for post-Soviet studies. This book examines a wide range of contemporary Russian writers whose work, after the demise of Communism, increasingly became more authoritative in debates on Russia's character, destiny, and place in the world. Unique in his in-depth analysis of both playful postmodernist authors and fanatical nationalist writers, Noorbendos pays attention to not only the acute social and political implications of contemporary Russian literature but also literary form by documenting the decline of postmodern styles, analyzing shifting metaphors for a "Russian identity crisis," and tracing the emergence of new forms of authorial ethos. To achieve this end, the book connects the fields of postcoloniality, trauma, and conspiracy thinking with post-Soviet studies, an endeavor that has been grossly overlooked until now. CHAPTER THREE	Empire of Empty Signs: Unsettling Imitations of "the West"
Boris Noordenbos is Assistant Professor in Literary Studies at the University of Amsterdam, The Netherlands.